This series has been pretty balanced. I am in my last class of my undergrad and today I had my very first live interaction (other than phone calls). We FaceTimed the class and it was way different than anything I have had over the last several years. I am praying about continuing on to a masters and, since I can’t move right now, I will be looking for a school with as much interaction as possible. Wish options like we have now had been available when I was in seminary. Between work, school, ministry, and family, those years were mighty grueling. I do think the training should be hard, but it's not necessarily the commute that should be the hard part! I think the DBTS series is rather poor. Tyler care to elaborate :)? Tyler care to elaborate :)? Other than the Hebrews passage at the end of this one it seemed reasonable enough. I think in previous discussions about this topic you and others have brought up the benefits of staying in one’s own local church. That is in many cases a huge benefit as well as being there for extended family, keeping kids grounded, etc. what else can you think of? Don't really want to elaborate. I'll simply say I believe DBTS is trying to shame people to attend classes on-site, and implicitly suggesting those who chose another option are unwilling to endure hardship. I'm unmoved by these cheap appeals. I don't see any "shame" there myself, but belief in the superiority of how education has been done for thousands of years is on that ground alone a position to be reckoned with. And of course schools that want to focus on the presence approach are going to try to motivate others in that direction. I think there are ways to blend the strengths of both options and lots of schools are working hard at that. I do think the training should be hard, but it's not necessarily the commute that should be the hard part! I *totally* agree. Moving, commuting, and re-arranging your schedule for traditional, on-site classes are challenges to conquer, but these are not necessarily the factors that make seminary education valuable. It is the academic rigor, interaction, writing, etc. that should be the challenge. Both traditional, online, and hybrid options are able to provide these challenges. Allow me to retort. Which is harder, learning the original languages in class or on-line? Which takes more effort and stewardship, having a f/t job, leading your family, serving in a meaningful way in your church, and taking 2 or 3 classes a semester ... or working p/t, maybe having a family, maybe serving in a church, and spending most of your time in class or the library? Look, if the "ideal" seminary education must involve suffering and hardship, I'd say let's do it right. Don't allow seminarians to use resources like ebsco, logos, or computers in general. If they want to research the NT manuscript evidence, make them travel to the museums in person instead of looking at the manuscript evidence on-line. After all, all these resources and tools were designed to make learning and theological education easier and more convenient. Or, you could learn to be a better steward of your time and energy and take advantage of the tools available to you. At the end of the day, each man will be accountable to God as to whether he was a faithful steward and minister of the Gospel (1 Cor 4) ... not whether he suffered and endured enough hardship in seminary to qualify him to really be a minister of the Gospel. If you are going to retort, make it better than this. No one has argued it should be hard for the sake of being hard. So why respond to that? No one is saying that. So if you are going to retort, at least retort to something that was said. Do you believe that young men training for ministry are beyond being challenged about their mindset towards preparation and the best way to do it? Contrary to what seems to be Tyler's assertion, this article (and all the others I believe) said that a distance option is a good option for some people. In fact, DBTS has done some distance classes as Ben mentioned in this article. As Ben said here, there are a variety of factors that inform the decision. And if you haven't, make sure to read the comments where Ben responds again. The point raised by the article--the desire to do distance education for convenience--is undeniably true, isn't it? (One article somewhere mentioned that even local students will sign up for an online class to avoid having to go to class). And if convenience or lack of hardship is the sole reason or major reason for choosing distance ed, it might be good to be ashamed of that. Or at least be challenged on it. This convenience/hardship motivation has been admitted by people both here and elsewhere. They plainly said they didn't want to move, leave their job, put their family through it, etc. Tyler himself has said he didn't want to leave a good paying job with good benefits for himself and his family in order to take a lesser paying job with fewer (or no) benefits working for a church. I presume the same would apply to schooling though I don't recall if he said that. That's fine if that's what he wants to do. A man has to provide for his family and there are multiple ways to do that, so I am not sitting in judgment on Tyler for that. I was bivocational (even trivocational) for a time, so I know the life. Tyler has also been clear that many churches can't pay enough to support a pastor and that creates hardship and inconvenience. So Tyler admits the point. There are some people, again not all, who are looking to avoid hardship and inconvenience. They are looking for the easiest way to get training and credentials for ministry.That, in and of itself, is not wrong. But can't we at least ask question and challenge thinking? The bigger question to me is this: Why is it that some we think young men who feel called to pastor are above being challenged about the mindset they have towards preparation? If a man in his 20s takes shortcuts in preparation for ministry, what does that say about the future? Maybe nothing; but maybe something. To borrow a line from Jeremiah, it is good for a man to bear the yoke in his youth. Think about how many services there are offered today to cut hours off your prep time for preaching. Why are we trying to do that? Why is that a selling point? It is a mindset that there are other more important things to do than to train and prepare for ministry. IMO, that should be challenged, regardless of how one answers the questions. When someone points out a possible problem with that mindset, it should not be dismissed with the wave of a hand. In many cases, here at SI and other places, we see the problems that come with avoiding the commitment necessary to do the work of ministry. And it's troubling to me. But more to the point, Tyler, if you have no interest in engaging, then why post in the topic? That is what gets threads off the rails as we have seen lately. I would welcome substantive engagement on this topic. It's a worthy one. But to post your disagreement and call out someone for shaming and then be unwilling to back that with an argument seems to me to indicate it would be better to stay out of it. For 12 years I commuted to DBTS 45 minutes each way while pastoring fulltime and raising four children, managing a Christian School, and serving on several ministry boards. On most occasions I had to be at DBTS by 7 AM. It was very difficult. Yet, the training I received in person was invaluable to me. All of my professors are close friends of mine and I borrow their wisdom continually. The personal interaction with my professors, the ability to ask questions before and after class, and the social bonding affected my life and ministry profoundly. 130 graduate hours take a long time, especially when many classes were only 2 credits (that has changed now). DBTS was and is a very demanding seminary. They have made the school more accommodating in the last ten years. I highly recommend it. This is not to discount the help and practicality of online education. As the chairman of the academic committee at BJU, we are greatly expanding that form of education. Currently BJU has a grand total of 300 plus students in their seminary programs which includes both on-site and online students. Regarding T. Howard's comment, I'll grant Larry's point that nobody is fessing up to deliberately making things difficult, but look at the article Tom's responding to; the title says that theological training is supposed to be hard, and the rest of the article defends the notion of the difficulty of moving to the seminary, etc.. Now to be sure, "follow Me" is a command, but then there is the counterpoint of "my yoke is easy and my burden is light." I think we do need to find some balance where the difficulty is in following Christ, not in other burdens that find us. If you choose an online degree, a shorter program, or a program without a biblical language requirement because of convenience, what does that say about your commitment to the task you claim God has given you? Trying to avoid biblical languages is a common thing today, but that is directly against trying to have a better grasp of God's word. This, for one who intends to be a preacher, IMO, should not be avoided at all (for convenience or otherwise). Exegeting the word of God to the best level requires such training (that's not to imply that good cannot be done by preachers who are not so trained). Taking a shorter program simply relates to "how much" training one wants to get, and of what type (what mix of classes). For the Bible, I think everyone would agree that "more is better" (the more we study and think about God's Word, the better). But not all that training has to come in a single degree program. One might opt for a shorter degree now, with the possibility of later expanding the education. Others might choose to get as much now, realizing they may never come back to formal education again. Hopefully all preachers "self-learn" throughout their ministry, whether they ever return to formal education or not. So convenience to get some training now, with plans to expand later is not necessarily wrong. Taking an online course has different convenience accommodations than moving to study, but it is not necessarily more "convenient." I try to help my students in my online graduate classes realize what they are in for. We offer a 7-week versions of a full term (15 week) classes, which means they are double the pace and intensity. So taking a 3 credit class in a 7-week version will feel like you are taking 6 credits during that time. It means the 135 clock hours expected of a student in a term (to meet standards for graduate level credits for in-class as well as study/work outside of class) will map out to about 19.25 hours a week: the equivalent of taking on a part-time job. If a student chooses to take two classes during the same half-term session, then they are taking on expected load of a full-time job during those 7 weeks. Add that into one who may already be working a full-time job, doing ministry, raising children, etc., and something will have to "give" (sleep, maybe). So online may not be so "convenient." Often when people move to go to school, their focus is school, so they expect the "full-time" of courses, and have possibly arranged work such that it is part-time, and ministry is "there," but not "full-time." So one changes the conveniences depending on the route one takes (and that is not to say that online vs. in-person need be different: one can be full-time at it all, doing in-person courses, and part-time at "life" while full-time doing online courses; but generally it falls as I noted above). So regarding online vs. in-person, it is all matter of what "mix" of convenience one wants to have in one's life, but no matter what, there are going to be inconveniences experienced. Do what works for you, but don't cheat yourself on the learning needed to be an ever more effective minister (whether that is "self-learned" or formally gaining a degree). You need biblical languages. If you choose a program because it skips that requirement, then you're making a mistake. I enjoy Greek a lot. I translated the passage I preached last week. You need original languages. I define "online" as completely internet-based, with interaction through recorded video and in comment boxes (etc.). It's asynchronous. This requires the highest degree of dedication. I define "virtual" as a synchronous presence in class, live, where you can interact with the students and the professor. This is the best distance option. I believe Maranatha offers this for all its Seminary classes. The seminary is not the local church. Wallace (whose article spawned the DBTS series) overemphasized the seminary's role in mentoring. This is a common trend. Go to a good seminary that offers good academic rigor, with original languages. This might be in-person, online or virtual - your own context and circumstances will determine what is best. Don't let well-meaning professors shame you into moving across the country; it's not always the best option for you. And, in 2019, it doesn't have to be the only option. In-person theological training in a formal graduate setting isn't the biblical model for theological education. It isn't even necessarily the best model. It's just the model we're used to. Whatever else may be said in this thread, that bolded statement will always remain true. Remember that. Larry, the article did make the argument that seminary education is supposed to be difficult, and that those who try to make their seminary experience less difficult (or make it more convenient) are somehow less qualified to pastor a church. Then, it misquoted Scripture to prove the point. Of all the arguments against on-line seminary education, this is the dumbest I've read so far. But, back to your questions. #1) Yes, so what? #2) No, so what? The answers to both of these questions are irrelevant. 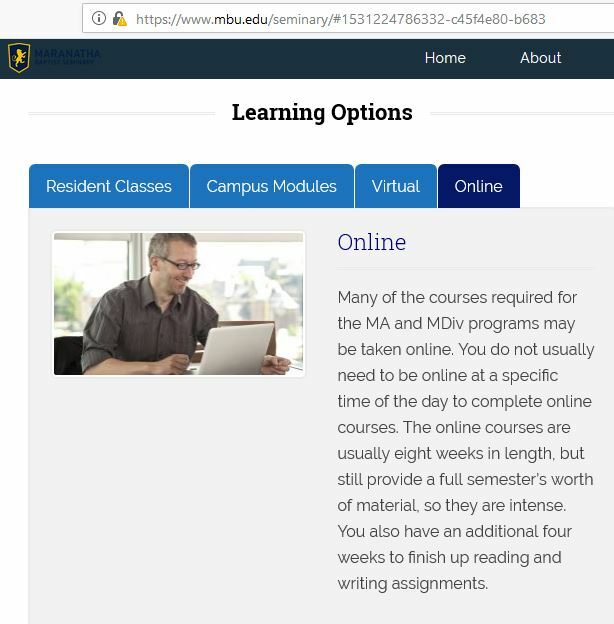 I would argue that it is actually harder in some cases to complete your MDiv on-line. It took me 6 years to complete mine. How many pastors who complete seminary on campus in 3 years stay in their pastorate for 6 six years? According to Thom Rainer, the average tenure of a pastor is less than 4 years before they move on. Based on this, I could argue that completing seminary in 3 years is actually teaching men to view ministry as a short-term gig. Here's my proof text to make my argument sound biblical: Matthew 24:13. I believe this is true, not because it makes you a slacker, but because you're not properly equipped to handle the Word of God. Thanks THoward. I wonder if you might refresh my memory about your education and seminary experience. You have probably mentioned it and I have forgotten. Larry, the article did make the argument that the more difficult the better when it comes to seminary education, and that those who try to make their seminary experience less difficult (or make it more convenient) are somehow less qualified to pastor a church. I am not sure you are representing the article properly here. I was at DBTS and I know they could make it harder. But I think the overall point is different than what you are representing here. Then, it misquoted Scripture to prove the point. No, I think the quote was actually correct. What part of the quotation was misquoted? Might that say something about you, particularly since you seem (by your answers below) to agree with the concern of the article? How is it a dumb argument to suggest that those wanting to take the easiest way out should reconsider their qualifications for ministry? Perhaps you could enlarge on that a bit so I could undestand it. So what? You admit that the problem is real (#1) and the young men should be challenged on it (#2). So you seem to agree with the article's intent, if not the full application of it. So it seems relevant not only to the broader picture of training but also to your particular comments. How can you object or consider it dumb when someone addresses the problem you admit exists? I would argue that is it actually harder in some cases to complete your MDiv on-line. Tim Miller, in the Jan 2 article, said essentially this same thing. So again, it seems like you agree. He talks there, as does Ben, about the kind of students that typically do better in online or virtual education. How many pastors who complete seminary on campus in 3 years stay in their pastorate for 6 six years? Not sure. Do you have any stats on the average tenure of a pastor with an MDiv? Because if you don't, your attempt at an argument is actually irrelevant. According to Thom Rainer, the average tenure of a pastor is less than 4 years before they move on. And? How does this help anything? Let's say this is true and it is wrong to stay so short. But what if that pastor goes on to pastor, say, 8 churches for a period of 4 years each. That's 32 years of ministry built on a 3 year educational investment. And maybe that short tenure is due to a lack of educational and ministry preparation. Again, without stats, we don't know. So the argument doesn't help anything. Based on this, I could argue that completing seminary in 3 years is actually teaching men to view ministry as a short-term gig. Here's my proof text to make my argument sound biblical: Matthew 24:13. You could only argue this legitimately if you see ministry as an objective list of tasks to accomplish. And there is some validity here. Some people are church planters who go to spend a specific amount of time starting a church and then hand it off to someone else to pastor so they can go and do it again. There's nothing wrong with that. It depends on gifting and calling and desire. But typically, pastoral ministry is not a curriculum of 90-something hours to complete. So you can't legitimately argue this is the same thing. But hey, it's SI. No limit on the kinds of attempts are arguments that can be made. I am not sure you are representing the article properly here. I edited my response before you posted to make sure I did better represent the article. My point stands. What part of the quotation was misquoted? The quotations were used out of context. So what? You admit that the problem is real (#1) and the young men should be challenged on it (#2). So you seem to agree with the article's intent, if not the full application of it. Having a "mindset of convenience" may or may not be a problem. It depends on the situation. But to assert that wanting to make one's education more convenient necessarily implies someone is a slacker and not qualified to pastor is absurd. Again, we do all kinds of things in our life to simplify tasks and to accomplish better and faster results. I remember I was the first person in my undergrad classes to use a laptop in class. It made taking notes quicker and easier. I remember moving from creating Hebrew vocab flashcards by hand to getting the Hebrew flashcard app on my phone. It made learning Hebrew vocab easier and more convenient. Based on this, you could say I have a "mindset of convenience." So what? A few years ago, an acquaintance of mine wanted to pursue an engineering degree. He was a bright kid (got a perfect score on the math/science section of his college entrance exam) and could have gone to any one of several schools without shelling out a dime. But those degree programs were not competitive and held out only minimal prospects. So he applied and was accepted into a more rigorous program of study. Those four years were not easy. The classes were really hard. It was expensive. He had to work a lot of hours. He had to do a lot of driving in the best transportation $800 could buy. He went to every class in person because, in the engineering field, the weaknesses of online instruction are uniformly acknowledged. When he got married, he moved to an apartment in a less-than-perfectly-safe part of town and his wife went without a lot of the conveniences that her peers enjoyed. But at the end of four brutal years, they got what they wanted, and now that decision is paying dividends. The series under review is not suggesting that Paul was advocating for a difficult commute, that suffering is inherently noble, or that online education is necessarily substandard. What it is suggesting is that the decision-making process by which seminary degree programs are chosen should not begin with questions such as (1) Will I have to relocate or get a different job? (2) Will this be hard for my family? (3) Can I do this from the comfort of my home? (4) Will I have to forego some of the conveniences to which I have become accustomed? These questions are not superfluous, and need not be excluded from the decision-making process. Still, it is troubling when these questions are the first (and even the only) questions that prospective students ask. If students in medicine or the hard sciences don’t make their academic decisions based firstly on answers to questions such as these, why would a theology student, who actually signs up for suffering, make this his first line of evaluation? 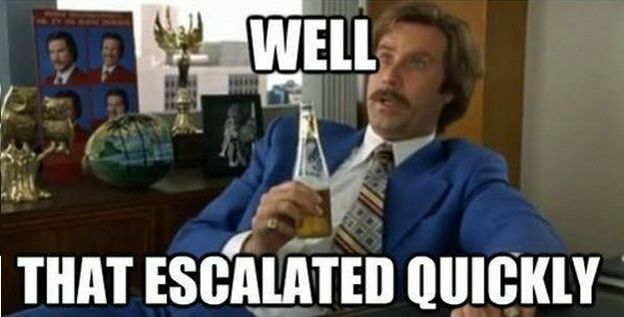 At work, our Attorney Manager defeated the former WA Attorney General (who was in private practice) in a particular litigation. The former AG went to University of Chicago law school, where he was on the law review. Our Attorney Manager attended a state school with much less "prestige." He won anyway. Why? Because he's good. I remember working a sexual assault case, and we were obligated to bring in NCIS. The agent was clueless. He had far more "formal training" than I did, and was a Federal 1811 series criminal investigator. He was still clueless. Yet, there I was with on the job training and a certificate from the U.S. Naval Security Forces Academy, and I had to coach him on what to do. I know we all know this, but perhaps we forget it? You get out of a program what you put into it. You can succeed very well in-person, online or virtually. It depends on you and your context. I thank you for your kind endorsement, but I am afraid I cannot reciprocate. It is neither good or correct to say that "you get out of a program what you put into it, no matter where you go or in what format you attend class." It is true, of course, that those who put nothing into their classes will get little out of them. Still, the idea that it makes no difference at all where one attends school is surely not an accepted one. I'm not saying it doesn't matter if someone goes to, for example, Fuller. I had hoped that would be understood. I mean to say that if you go to a good school with good academic standards, and a statement of faith and philosophy you can get behind, it doesn't matter what format the classes are delivered in - you get out of it what you put into it. It seems that some people are not understanding what I was trying to say, which could be because I was not clear when I wrote it, they are not reading me rightly/fairly, or some combination of the two. So let me try to clarify. Second: I agree wholeheartedly that claiming in-person education is better simply because it is harder would be dumb—which is why I was not making that claim. My previous post was designed to make the claim that in-person education is superior—all other things being equal. This post was a follow-up to that. Think of it this way: someone agrees with my first post, “yes, all other things being equal, in-person education is better. But it’s really inconvenient to go that route, and other options seem easier, so we should choose those other options.” To that person, I’d say “That’s not the right mindset to have. The Christian life is not about what is easiest and most convenient, but about doing what God requires. And he has told us repeatedly that what He requires entails hardship. If you think you found an easy, convenient path to serve Christ, you probably found the wrong path, because that’s not what serving Christ looks like. Instead, it looks like denying yourself now so that you can enjoy eternal glory later. Don’t choose the easy path. Choose the better one.” So this post was not an argument for the superiority of in-person education, but a pushback against one of the criticisms of in-person education (i.e., it's not convenient). Any theological education done right will be hard, whether distance or in-person, so don’t eliminate options simply because they are not convenient. Third: Is it wrong to want convenience? Not necessarily. It is wrong to want convenience at the expense of what is right and good. I think most examples that have been given about things that are “more convenient” were not actually decided on the basis of convenience but on the basis of what is better: more efficient (not the same as convenient) and more effective. IOW, the contrast I’m laying out is not between choosing something that is easy vs. choosing something that is hard, but between choosing something that is not as good just because it is easy vs. not choosing something that is right/good because it is harder. So, to pick one example, would it be wrong to use electronic flashcards rather than creating Hebrew vocab cards yourself? No, unless it meant you were not able to learn Hebrew as well. To use another example: using a computer to take notes is not the most convenient choice--not taking notes and just looking at someone else's is. Would that be wrong? It would if you learned better by taking notes but didn't want to put in that effort. Hopefully this makes my point a little more clear. By your definition, I am not a "purist," and know few if any "purists." 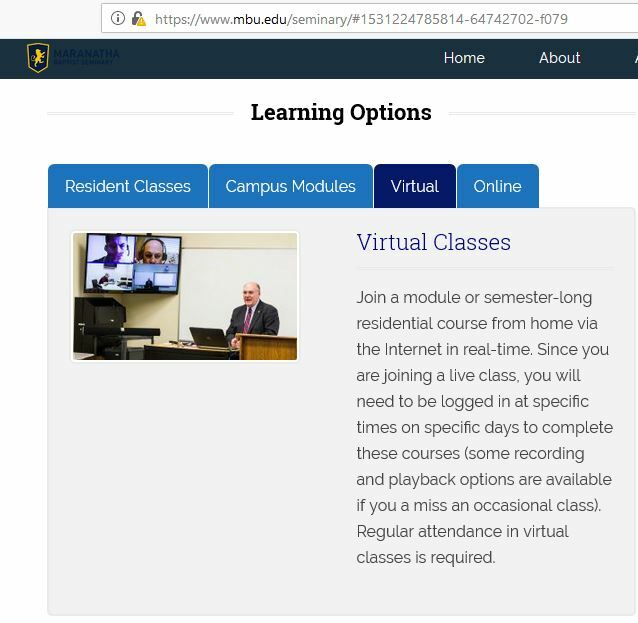 Here at DBTS I teach online students every semester, and have no delusions that a formal classroom is the "only" setting in which ministerial education occurs. As you regularly observe, pastoral mentorship is a vital part of ministry preparation, and this has always been a point of emphasis at DBTS. So I agree, firstly, that "in-person theological training in a formal graduate setting isn't the biblical model for theological education." Whether it is the best model depends in part, I think, on one's milieu. In our 21st-century American setting, it is hard to improve on the idea of educational centers with (1) terminally-educated instructors in each field and (2) highly-developed resource collections. There is great value in being able to interact face-to-face with such instructors and also to access a library that has resources that far exceed what may be found generally in most local settings. (I am aware, of course, that EBSCO and Logos and the Worldwide Web are expanding daily, but none of these is keeping up with, say, technical monographs in a way that a seminary library can.) Is it the BEST setting? As an academic, I try to avoid universals, but it is a historically well-attested approach. Where I would disagree, however, is that formal classroom training is "just the model we're used to." The idea that seminaries are simply limping along doing what we've always done because we've always done it that way is simply untrue. I teach at seminary because I feel it is the most productive and effective way that I can serve my church with the gifts God has given me and to do my part to take "the things that I have learned in the presence of many witnesses and entrust to reliable men who will also be qualified to teach others." Where I would disagree, however, is that formal classroom training is "just the model we're used to." The idea that seminaries are simply limping along doing what we've always done because we've always done it that way is simply untrue. That wasn't what I was implying. I appreciate what you folks are doing and like your seminary. Ben - no worries; I where you're coming from, now. Ben, I appreciate the last sentence in the quote above. That being said, "doing what God requires" does not mean purposely seeking out hardship and suffering when it can be avoided or mitigated within the bounds of Scripture. Hardship and suffering will come, we've been promised that, but God doesn't require us to purposely seek out the road of greatest hardship and difficulty in every aspect of life. We're not masochists. Thus, the premise of your argument is invalid. Sometimes the "better path" can be the easier path. As it relates to seminary, if someone wants a quality theological education and doesn't want to uproot his family and quit his job to do it that doesn't say anything about his ability to be a pastor or to suffer hardship for Christ. That just means he's found a way to get a quality theological education while being a good steward of his time, family, and money. I assume the invalid premise you are referring to is something like: “Doing what God requires means purposely seeking out hardship and suffering when it can be avoided or mitigated within the bounds of Scripture.” But as I already stated, that is not a premise in my argument. I think you are reading that in to what I am saying for some reason. The discussion has been helpful to me. Am I right that these points are not in dispute?